I’m really bad at sorting out my hair, I’ve never been one to make regular appointments. But I thought now I’m a full fledged adult I should get round to getting a hair cut more often. I’ve let my hair grow for months on end and I was still growing out red dye. Word of warning, red is the toughest colour to get out. Luckily my hair was in the amazing hands of Laura at Harlow’s Den in Leeds. My hair was down to my waist and was looking a little like rat tails. It was getting hard to even run a brush through it, yes I am a 26 year old woman… I had some length cut off and also my layers cut in. I wanted a dip-dye to get rid of the red, so opted for a warm honey blonde. Although because it is so tough to get out, Laura informed me it might take a couple more dyes to get rid of the warmth of the red. I’m really happy with the way it turned out, the great thing about Harlow’s Den is that they take their time on your hair. So many times I’ve been at other salons where they are to quick to rush you out of the door. I think it’s important to feel pampered as part of the experience. 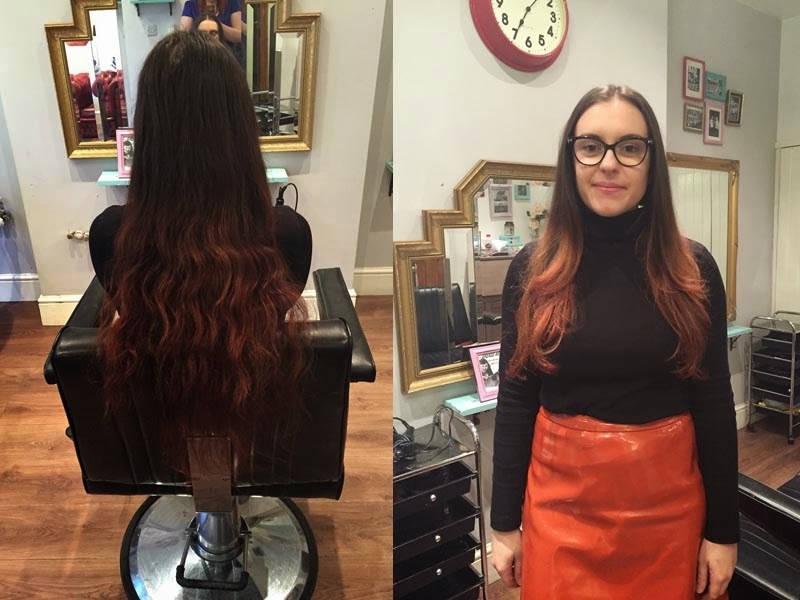 I was so happy with my final new do’ – it feels so much thicker and healthier. The colour adds something a little different too. Head over to the Harlow’s Den Facebook page to see more of their awesome work.